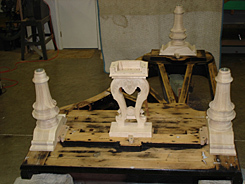 In my procedure, the case is dismantled as far as possible without disunion.The condition of the rim, beams, crossblock and keybed is checked, with fortification executed as necessary. 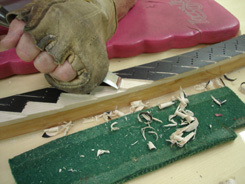 Broken and missing pieces of cosmetic veneer on the exterior are replaced. 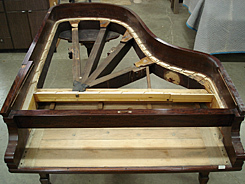 The ancillary case parts (the toplid, for example) are checked for splitting and delamination. 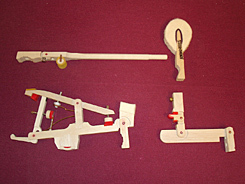 New components are manufactured and fit as required. 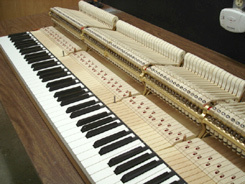 One of the two operations I do not undertake personally, the application of the closed-pore, hand-rubbed new lacquer finish, is subcontracted to Kevin Hancock (www.hancockrestorations.com), a world-class piano refinisher located in the Baltimore area. Once returning from his shop, all the nickel plated hardware and decorative felting is reinstalled and the grand piano once again takes shape in glorious new clothing. Into the rim goes a new soundboard. 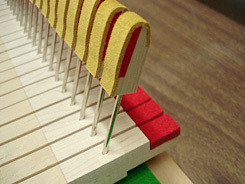 It is my opinion all vintage pianos require new soundboards. Some may take issue with this position. 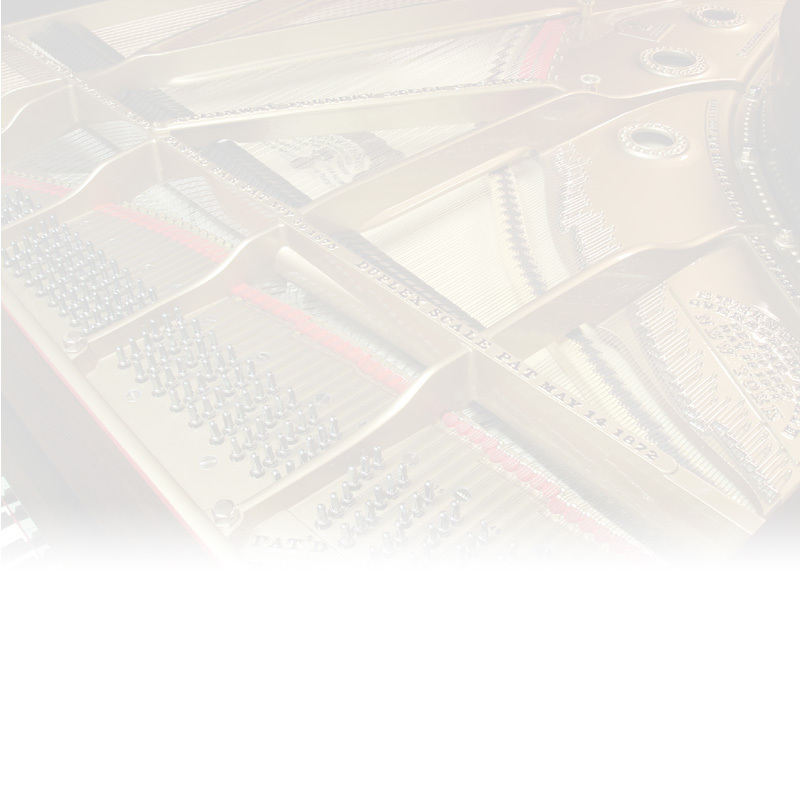 Consider this: the current new piano production quota at Steinway & Sons hovers between six and eleven instruments per day, depending on economic factors. 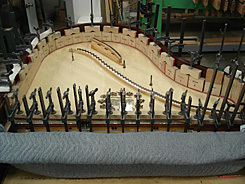 Steinways mindset is not to scour the globe for their vintage grands only to remove their soundboards for installation in these new instruments: they make new soundboards - up to eleven of them every day. 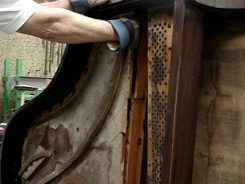 There is nothing magic about a 90-year old soundboard panel. 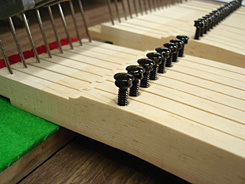 The magic, should it exist, is how a soundboard is fabricated, shaped, installed and ultimately loaded with string downbearing, regardless of its date of birth. 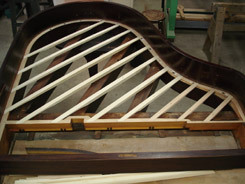 The mere ease of removal of a 90-year old soundboard from its rim, i.e. its decrepit glue joints, is sufficient argument to install a new one, all other acoustical and mechanical benefits notwithstanding. I replace the bridges and pinblock as a matter of course as well. 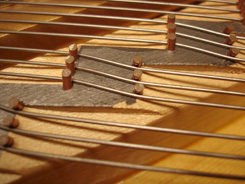 It is said the bridgework dictates the cleanliness of piano tone. Im proud to state the bridges emanating from my shop are considered exemplary by fellow high-end rebuilders nationwide and manufacturers alike. 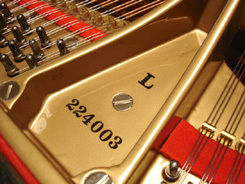 The plate is refinished in vintage Steinway gold, hand lettered, fitted with new agraffes, hitch pins and felts, and the serial number is reapplied. Only the finest music wire from Roslau and bass strings from G.C. 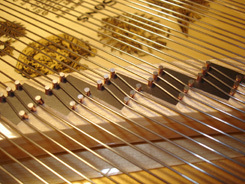 Bass Strings are utilized. With this work complete, the belly projects effortlessly and immediately, possesses ample sustain, and can lyrically provide the full musical dynamic range. No matter who may make the claim, no amount of action regulation or hammer voicing can save a mediocre belly job. The vibrant belly now needs a mechanically efficient and expressive, tactile keyboard and action to set it singing. With few exceptions, to idealize action geometry I install an entirely new keyset, which can be covered with either standard acrylic keytops or legal, pre-ban ivory. 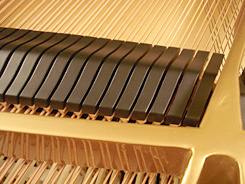 Genuine ebony is used for the black keys. I draw up the specifications for these replacement keysets and have them made by the countrys finest key maker, Rick Wheeler, RPT (www.roselandpiano.com), located in the Pacific Northwest. 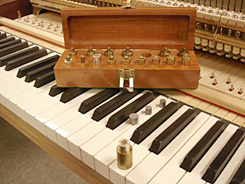 These keys set a new hammer action into motion, consisting of Steinway hammers, Renner hammer shanks and whippens. 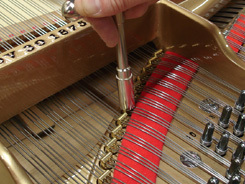 I insist on Steinway hammers: they are imperative to producing the classic Steinway tone. 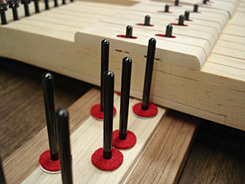 At the rear of the action lies the damper system. 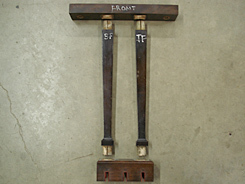 The original actuating levers are replaced with Renner units, and the dampers themselves get refinished and refelted, along with all guide bushings. Further, the pedal lyre is rebuilt, modern adjustable rods are fitted, and innovative positive stops for the three pedals are installed. Merely installing and regulating new action parts, however, is only half the story. 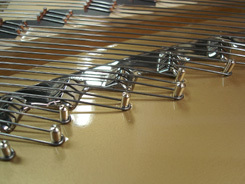 The weight of the new parts is critical to effortless, expressive playing at the key. My actions are balanced to produce ideal touchweight (downweight) and maximum upweight (repetition) with minimal inertia and momentum interference. 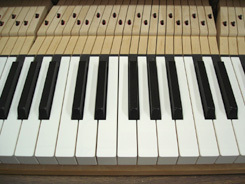 As such, the keyboard becomes an extension of the artists hands, permitting him or her complete artistic freedom. 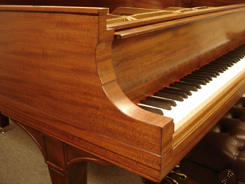 Many clients have been moved to tears upon playing their remanufactured instrument for the first time in my showroom, never before realizing the pianos potential.